This superb tripartite program brought together world dermatology luminaries from 21 countries. Attendees enjoyed dynamic Hanoi with its Parisian ambience and Asian vitality, welcomed by Asian Academy of Dermatology and Venereology (AADV) President Syarief Hidayat (Indonesia), Cambodian Society of Dermatology President Chan Vicheth, and Vietnamese Society of Dermatology (VSDV) President and AADV Deputy President Prof. Tran Hau Khang. 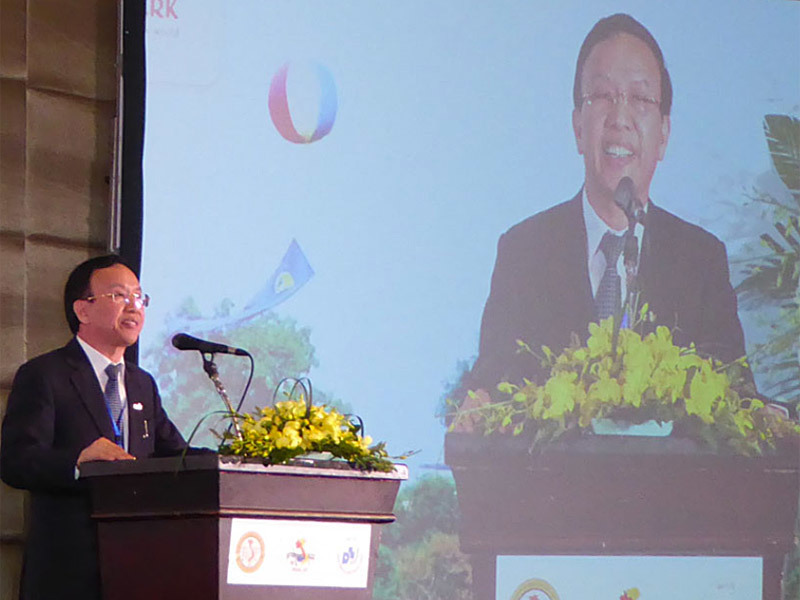 He opened the conference (Figure 1), ably assisted Nguyen Van Thuong (Vietnam). 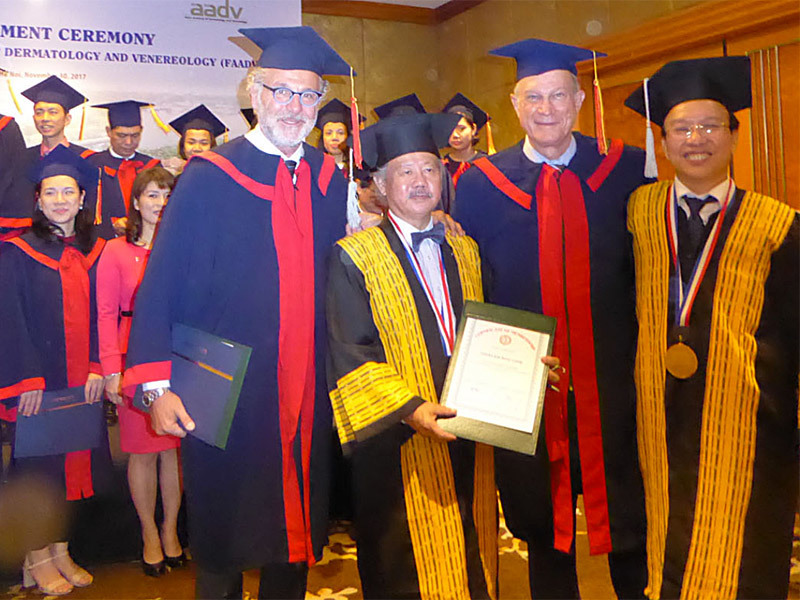 AADV President Syarief Hidayat, Deputy President Tran Hau Khang, and AADV General Secretary Steven Kim Weng Chow (Malaysia) conferred upon selected guests the title of Honorary Fellow (Figure 2). WHA Dermatology President Torello M. Lotti (Italy) promulgated the value of the present international cooperation (Figure 3). Plenary session lectures were given by Torello M. Lotti, Daisuke Tsuruta, Robert A. Schwartz, Stephan Lautenschlager, and Steven Kim Weng Chow. Torello M. Lotti proclaimed the value of low-dose cytokine therapy in dermatology. Daisuke Tsuruta (Japan) covered management of psoriasis and psoriatic arthritis. Robert A. Schwartz (United States) focused on Kaposi’s sarcoma. Stephan Lautenschlager (Switzerland) adroitly detailed etiologies of genital ulcers. Steven Kim Weng Chow emphasized the need to avoid acne scarring. Additional presentations were superb. Indonesian Society of Dermatology President M. Yulianto “Wawan” Listiawan documented the value of utilizing the vascular laser. 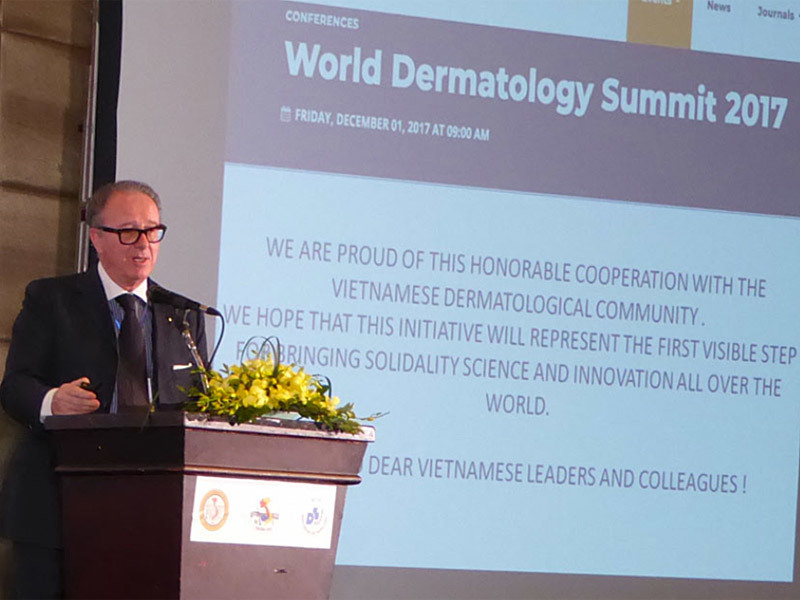 Cambodian Dermatology Society President Chan Vicheth delineated challenges in acne therapy. Xing-Hua Gao and Hexiao Wang (China) found that combining heat shock protein beta-1 deficiency with hyperthermia enhanced melanoma cell death in an experimental model. Giuseppe Micali (Italy) stressed the hidradenitis suppurativa clinical spectrum. Agharid El-Gammal (Egypt) advocated treating psoriasis with a special combination of aloe vera and proplis. Christian Diehl (Argentina) covered plant-derived therapies for vitiligo. Davinder Parsad (India) evinced recent advances in vitiligo treatment. Yan Valle (Canada) brought United Nations’ International Day of Persons with Disabilities (December 3) to the forefront with its declaration on the human rights of the disabled, prioritizing chronic dermatologic diseases. Michael Tirant (Australia) targeted the role of super-antigens in treating psoriasis. Boudda Bounmyviset (Laos) noted acetaminophen as a cause of Stevens–Johnson syndrome/toxic epidermal necrolysis. Francois Niyonsaba (Japan) discussed skin-derived antimicrobial peptides. Magnus Unemo (Sweden) expressed global concerns with antimicrobial resistance in Neisseria gonorrhoeae. Giang Nguyen Huong (Vietnam/United States) articulated an update on cutaneous lymphoma and its rare variants. Jason C-H Yang (Formosa) highlighted management of stasis dermatitis. Manu Jain (United Nations) demonstrated the value of reflectance confocal microscopy in inflammatory cutaneous lesions. Rungsima Wanitphakdeedecha (Thailand) delved into Asian concepts of beauty. Seow Chew Swee (Singapore) depicted Scytalidim dimidiatum as a non-dermatophyte causing skin and nail infections that often result in treatment failure. Many superb poster presentations were also provided, as was a spectacular gala dinner. Aurora Tedeschi (Italy), Srie Prihianti (Indonesia), and other guests were grateful to the host dermatologists, including talented Vietnamese-American Giang Nguyen Huong, a guiding light for many colleagues, as she graciously showed them the sights, sounds, shopping, and culinary delights of vibrant Hanoi such as the balut (fertilized duck egg) memorably consumed by Stephan Lautenschlager, Yan Valle and Robert A. Schwartz. Some explored Ha Long Bay, in the Gulf of Tonkin, with its thousands of magnificent limestone karsts and isles.